In the South, where folks hold close to their hearts a solid truck and the critical accessories to maximize work and tailgating, you have to wonder how long it will be before we see hail cannons mounted on the back of an F-350 Super Duty. Hail cannons, it turns out, are the latest high tech offerings for automotive plants wary of having their brand new, sparkling products being damaged by sudden meteorological disturbances. The cone-shaped mechanisms fire a charge of acetylene gas and air to generate a Mach 1 shockwave into the clouds where hailstorms are being formed. While only effective in a 300-to-600-foot area directly over the device, the shockwaves turn the potentially damaging hailstones into rain or slush. Best of all, the machines fire themselves when their computerized sensors detect incoming hail. What’s not to like? Sadly for Volkswagen, which installed the devices around their Puebla, Mexico plant, there is a downside, according to a recent report in Jalopnik. Farmers in the area believe the cannons have caused drought in a 5,000-acre area and are suing the German automaker for $3.71 million. VW has switched off the automatic firing mode and is experimenting with lower-tech ways of protecting cars, such as mesh. Compensation hasn’t been ruled out, though Jalopnik notes some farmers use to cannons in efforts to protect their crops. 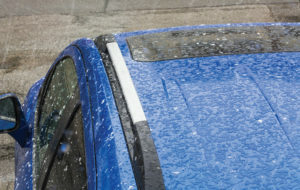 Nissan reportedly made locals unhappy with hail cannons as early as 2005. Meanwhile, football fans should be considering how hail cannons might be converted for parking lot use at football games, to hurl confetti or snacks at neighboring tailgaters.